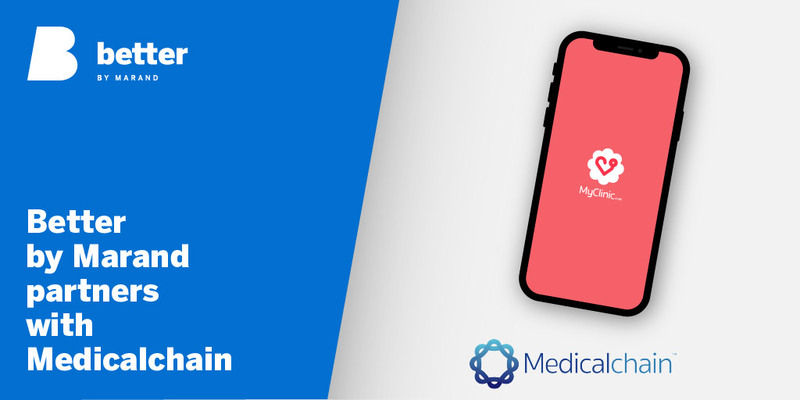 Medicalchain, who are building a decentralised platform utilising blockchain technology to store and share health data securely, and Better by Marand, a vendor-neutral data solution provider, announce a partnership to leverage the development of the new version of MyClinic.com, a telemedicine application that utilises blockchain technology to connect patients with their doctor through a convenient and secure video consultation platform. Medicalchain’s MyClinic.com app builds a better relationship between doctors and their patients, especially when access to healthcare is difficult. This is the first cross-border, telemedicine platform that will allow patients to complete video consultations with their doctor. At the same time, MyClinic.com will give patients the power to choose the best doctors to consult with, anywhere in the world. Medicalchain are committed to building the platform in accordance with open health data standards and the collaboration with Better by Marand is helping drive their development process forward as the openEHR specification gains traction, particularly in the UK healthcare digital community. The consulting team from Better are providing support to Medicalchain in the use of ready-made clinically verified models. On top of that, Better by Marand provides a set of out-of-the-box modelling and development tools which the Medicalchain team have adopted to help manage the complexities of health data and ensure the interoperability of the solutions and underlying platform. Roland Petek, Better Executive Sales Director, commented: To have a global-oriented product, it is essential to choose proven technology and one that can support such scale; and our Better Platform can surely be a match for this challenge. On the other hand, Better by Marand has an extensive network of hospitals, trusts and governments with whom we would like to share the achievements of Medicalchain, thus making their product available to a wider-global market through our network. Dr Abdullah Albeyatti, Medicalchain Chief Executive Officer, observed: Better by Marand have a great international reputation amongst healthcare institutions for their continued drive to provide an open standard for collating, managing and sharing electronic health records. This approach has made them an ideal partner for Medicalchain where our focus is to remove health barriers and allow patients the freedom to choose which clinician they consult with, in the format that suits them, with the added security and transparency of blockchain technology. Their extensive network of partners and collaborations amongst hospitals worldwide will serve as a great platform for us to launch our vision on a global scale. Medicalchain is an organisation focused on building patient-centric, borderless healthcare, by developing solutions and services that utilise blockchain technology. Medicalchain’s mission is to empower every person to own their health, by giving patients full immediate access to view and share their health data, while connecting them with an ecosystem of the world’s best healthcare practitioners and providers. Better by Marand is one of Europe's leading healthcare IT solution and professional service providers. They collaborate with a variety of clients on the same goal – to set them up for the future. The future that moves towards open platforms and away from siloed solutions. The future where clinical teams can work with any digital solution provider without being tied to a particular vendor. In turn, storing data in an open, vendor-neutral format will incite vendors to innovate and create better solutions. Their core technology solution, the Better Platform, is well-aligned with this vision and is based on openEHR specifications. Their OPENeP by Better product (a closed-loop medication management system) is built on top of the Better Platform and follows the same vision. Their innovations have so far taken them to 3 continents and 15 markets, including the UK, the Netherlands, Germany, Malta, Russia, Norway, Finland, Italy and Slovenia.